Gegen den Zwang zur 'gesunden' Mutterschaft, gegen den § 218 ohne Zucht und Ordnung! Humangenetik ist Auslese und Ausmerze! Against the compulsion to 'healthy' motherhood, against Paragraph 218 without discipline and order! Human genetics is selection and extermination! This “spuckie” sticker from the 1970s features a black and white Xeroxed image of two women marching with guns. Spuckies are small, handmade stickers made from lightweight paper that are stuck onto a surface by licking the back rather than using an adhesive backing like most modern stickers. The lack of complex or expensive materials provided an easy alternative to other methods of sticker making. 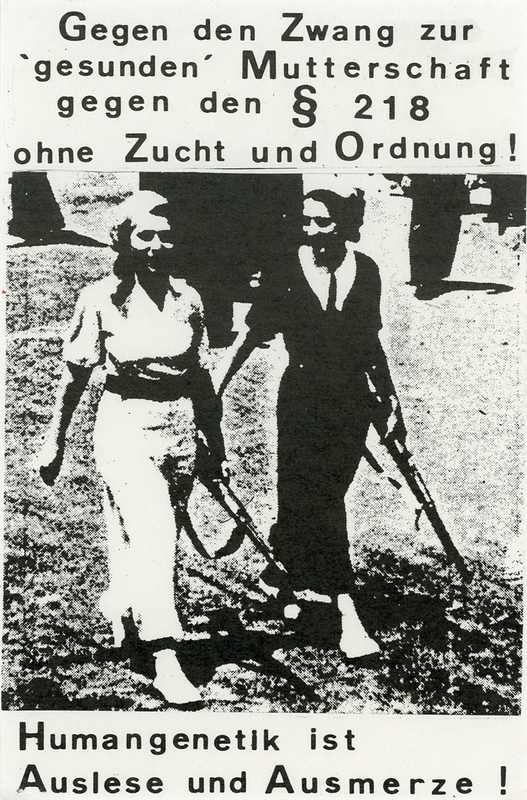 The § 218 references the women’s group who fought against the section of the German Penal Code that makes abortion illegal. This sticker refers to the ability for women to have autonomy over their reproductive decisions.